The Cream | My go to cream product for my brows has to be the Anastasia Beverly Hills DipBrow Pomade, hailed as the holy grail product for brows, I haven't met anyone who doesn't love this. The cream formula is water-proof and smudge-proof and perfect creating those defined, natural looking brows. I have has this product for just under a year and it's a product I always reach for in my daily makeup routine. I originally had the shade soft but this was way too dark for my skin tone and blonde hair and washed my face out. When I was in New York I picked up another little pot of magic in blonde and its the perfect shade for me. I actually wouldn't say the shade is blonde, but more of a soft muted, mousy brown. I apply this to my eyebrows using the Real Techniques Eyebrow Brush after I've defined the edges with a pencil. The Pencil | I've tried out number eyebrow pencils in different shades and my favourite so far is the Rimmel Professional Eye Brow Pencil in Hazel. I use this product to fill in the edges of my brows, areas of growth and to lengthen. I love the way this pencil applies smoothly and you don't have to press down very hard to get some colour, unlike some other pencils I've used before. My one issue with this is that the shade hazel is still slightly too dark for me, so please Rimmel release a blonde shade! The Wand | A wand is probably my least used product out of all my brow products as for me it doesn't give enough definition on its own or fill me brows in enough. I tend to use a wand after i've applied to pencil or cream to help hide those pesky fly away hairs. The one I always tend to reach for is the Benefit Gimme Brow in light/medium, this is the perfect shade for my brown and helps enhance and define them. One of the main reasons I love this wand is the smaller brush, its perfect for my brows and it doesn't smudge the colour like i've found with other wands. 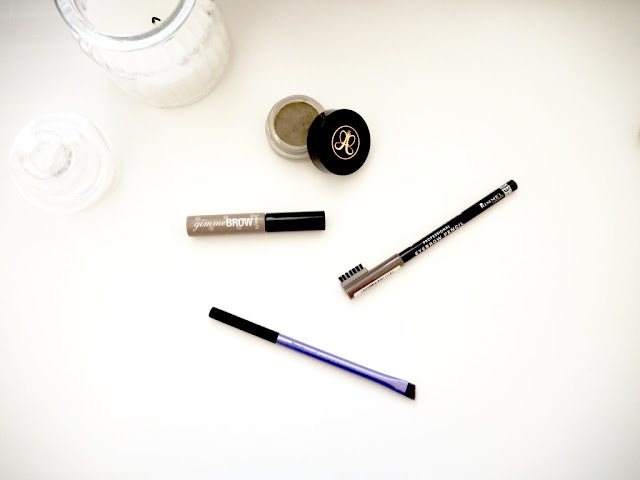 What are your top brow products?! I also love that rimmel pencil for days Im wanting a quick fill in! Love the Dipbrow Pomade! Soap and Glory brow products are my other go to's!